Dana Majhi received a Rs 9 lakh bank cheque donated by Bahrain Prime Minister Prince Khalifa bin Salman Al Khalifa at the Bahrain Embassy in New Delhi today. Dana Majhi, a resident of Melghar in Kalahandi district, grabbed headlines on national as well as international media in recent past for carrying his wife’s body on shoulders from the district headquarters hospital. KIIT University has helped him to travel Delhi today by Air India flight from Bhubaneswar airport. He was accompanied by two members from KIIT University. From Delhi airport, Dana Majhi went to Bahrain Embassy in Vasant Vihar area and collected his cheque. 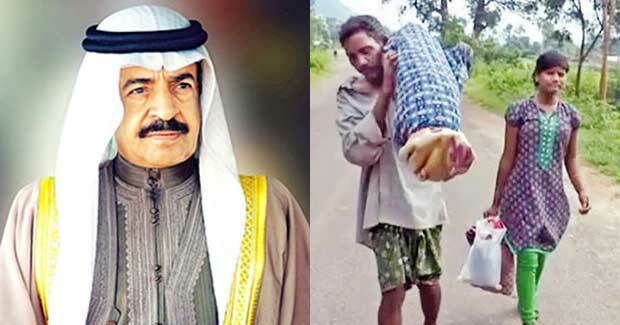 Dana Majhi expressed his gratefulness to the Kingdom of Bahrain for their helping hand.